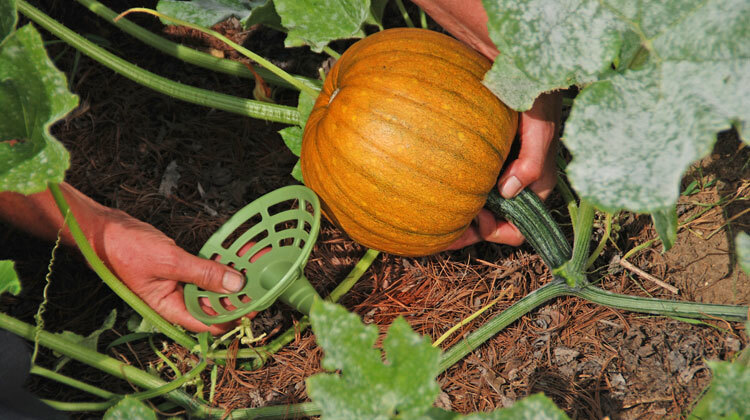 Protect your pumpkins, melons and squash from fruit-rotting fungi. Keep your garden weeded throughout the season. This increases light and airflow around the developing fruit, so they will dry quickly after rainfall and irrigation. This helps reduce the risk of disease. Remove and destroy any infected fruit immediately. Sacrificing one rotten melon can prevent it from infecting the whole patch. Do not compost diseased material as most compost piles do not get hot enough to kill the disease organism. Bury it away from your garden or contact your municipality for disposal options. Elevate the fruit above the soil to prevent bottom rot. Use a fluffy layer of straw or wood chips under the fruit to increase airflow and reduce contact with the soil. Or try melon and squash cradles that elevate the fruit above the ground to prevent rot and promote even ripening. A bit more information: Blossom end rot of melons is similar to that of tomatoes. A lack of calcium at certain times in the fruit’s development results in the blossom end turning black. Keep soil evenly moist to reduce this problem and have a soil test before adding calcium or other nutrients to the soil.